this post is sponsored by Unilever however all thoughts and opinions are my own. while it may seem unrelated to beauty it is not unrelated to me. taking care of children and creating environments for children that are healthy and safe is important to me. for my church i volunteer time on a regular basis to teach and engage with young children and provide them with a safe place to feel love. while many children receive a loving, safe, healthy environment at home there are also many who do not. projectSunlight by Unilever is a movement by people who are committed to creating a better future for children. it is a community of people who believe it is possible to build a world where everyone lives well and lives sustainably. with the holidays approaching i want to bring to your attention a project called #ShareAMeal. 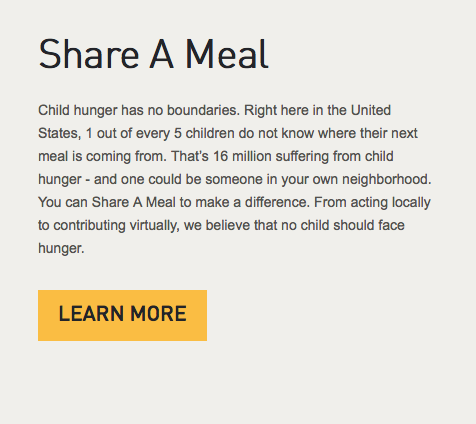 Share A Meal is a commitment to creating a world where one out of every five children is no longer faced with hunger. for more information on how to participate, join in and contribute time and talents visit www.projectsunlight.us. please join with me in the upcoming months to work with your community in helping to feed the hungry.